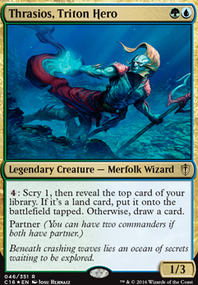 Ikra Shidiqi betrayed Tasigur with the help of our favorite hero from Theros and took her rigthful place on the Throne of Summer Nauseam. 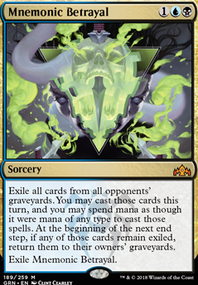 Win conditions include: Ad nauseam(famous one card combo) Nothing much to say here, resolve this and with the low cmc and all the fast mana you know the rest. Mnemonic Betrayal + (Pernicious Deed/Engineered Explosives) Mnemonic Betrayal in of itself can win games straight on, in midgame and lategame. In early testing this card seems like a new powerhouse of cedh. In Helsinki meta its presence has already started to warp the meta a bit. Coupled with deed or explosives killing most if not all you opponents fast mana its a sure victory on resolve, given there is no grave hate present. Paradox Engine + Thrasios, Triton hero + artifact mana + (Training Grounds). "Storming" of with Paradox engine is quite easy especially with the inclusion of Training grounds. Isochron Scepter + Dramatic Reversal. Core combo of the deck. After infinite mana and drawing you deck you can win with Praetor's Grasp getting an opponents wincon like labman or by looping cards with Copy Artifact copying Isochron Scepter. Ikra Shidiqi is an odd card, at first it seems like casual edh card or a good limited bomb, but it actually has a very important meaning in the deck. On the games where stax/control/midrange is included it serves as a very good blocker. 3/7 blocks almost anything infininely, like Ruric Thar or some other big creatures you might see in cedh. More important is the ability to gain life back to 40 or over, which enables ad nauseam wins to be easier. In stalemate games it also usually gains a lot if life so you dont have to worry about dieing. thrasios and baral being 1/3 makes it better too. Of coarse you only cast it in about 20-30% of games, but in the games you cast it its usually good. Scapeshift is going for a break and i will test how good yawg win is, even though i need to pass turn after casting it to win the game. It is there for more a hand refill/ comeback card after blowouts. It improves the decks reciliency too. Scapeshift feels like good in theory bad in practice card in the deck. Usually it is dead card and even when working has requirements to win from. Usually you are able to cast it before 7 lands and then you dont really want to cast it, manually casting the lands combo is much better after ad nauseam, because you can find summer bloom to make the land drops needed. Alchemist refuge for a basic is an easy swap, refuge was mostly in to this point because of scapeshift. There is some cute tricks you can do with it like drop a instant speed pernicious deed or engineered explosives or play a tutor at end step that normally is sorcery speed but ultimately this is not enough good when the deck really wants more reciliency against back to basics and blood moon and better mana base.